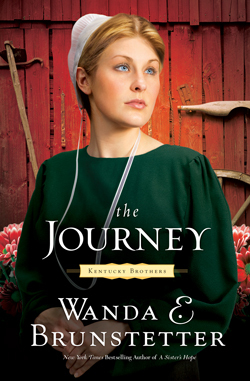 Come and explore the fascinating world of Amish through the pen of bestselling novelist Wanda Brunstetter. Since 1997, she's written more than 50 books, many of them about the Amish. More than 5 million copies of her books are in print. Brunstetter kicks off her new series, "Kentucky Brothers," with The Journey. Family values, faith in God, love and tragic loss hold the story together like carefully sewn threads in an Amish quilt, while scenes of Amish life--from the kitchen to the woodshop--provide the multi-colored patchwork. Carpenter Titus Fisher has left Paradise, Pennsylvania, for a new life in Kentucky, where he hopes to forget his sweetheart Phoebe. Although Titus is heartbroken, his family is relieved. The flighty Phoebe has left the Amish life for California and seems destined for trouble. Titus also hopes to distinquish himself from his twin brother to whom he's always compared himself unfavorably. Why does he always seem to make poor choices, and everything Timothy touches is golden? Titus longs for a sense of significance. He wants to settle into a job and perhaps, find another woman to love. Yet the challenges of a new life--and the very different types of women he meets--make his "simple" Amish life increasingly complex. When he finds a large sum of money, it complicates things further. The family Titus works for includes the conflicted Suzanne, a young woman who struggles to find her place in the traditional hierarchy of Amish family life. She yearns to work alongside her grandfather in the family woodshop, crafting cabinets and beautiful pieces of furniture. Her greatest joy is spending time outdoors. Yet, she is regulated to the kitchen, wehre her cooking is the subject of many jokes, and expected to do traditional women's tasks. Her family tells her she won't be attractive to a man unless she learns some homemaking skills. Suzanne doesn't care; she's never met a man who captured her heart. Languishing indoors, Suzanne burns to prove her non-traditional abilities to her family. When her grandfather's health falters, will this be her opportunity? And what about Titus, the cantakerous cat-hating new carpenter, with whom her best friend Esther is smitten? Why does Titus seem to avoid Suzanne? She is determined to find out.